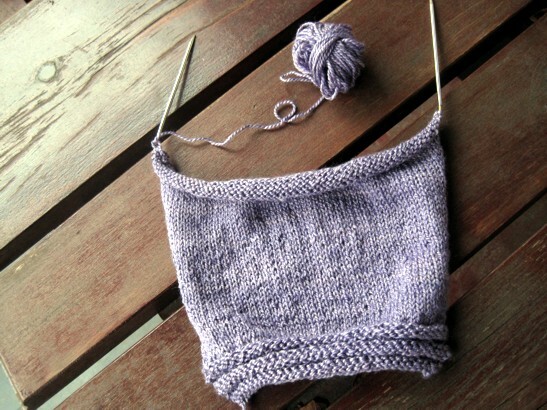 It is ironic considering the subject of yesterday's post that well before bedtime I discovered another sweater-in-progress with insufficient yarn: the purple baby sweater. That little ball at the top of the picture marks the remains of the yarn used for the entire original sleeve; I'm still not quite at the point of starting the sleeve cap, so clearly I'm going to need more yarn for this sleeve, and as much again for the second. Judging by the number of stitches and inches noted in the pattern, the body will take up quite a bit of yarn too, so I got out my scales. It looks like I should just make it through all those pieces if I don't also knit the yoke that pulls it all together and keeps it on the baby's shoulders. I can still pull off this sweater if I do contrast stripes along the waist of the front and back pieces (hurrah for starting the sleeves first) and echo it up in the yoke, but - the purple yarn being a wildly luxurious blend of merino and seacell - what colour? in what yarn? I haven't yet had the courage to rummage through the actual stash to find the answer to these very interesting questions. But I'm pretty sure it's not going to be the white, 100% acrylic, baby yarn.